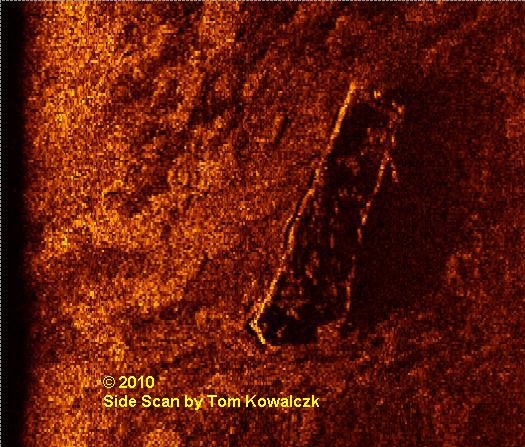 Shipwrecks in western Lake Erie. 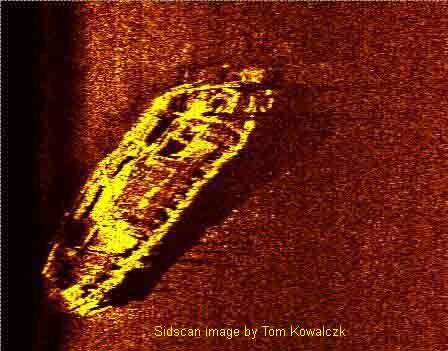 Some of these wrecks are popular dive sites. Wednesday evening the steamer WISCONSIN was run into by the propeller BRUNSWICK, one mile to the east of West Sister Light. The WISCONSIN was bound to Sandusky from Toledo, and the propeller running for Toledo, struck the steamer in her bows, causing her to sink in five minutes. No lives were lost, as the crew of the WISCONSIN were all taken aboard the BRUNSWICK, which was comparatively unhurt. The Sandusky Register says, the WISCONSIN was owned, three-fourths by Capt. T.J. Titus and one-fourth by Geo. Davis of Buffalo, and was running in the Sandusky and Buffalo Stock Line. her worth is estimated at about $15,000. She will, of course, prove a total loss, though the engine, which is a very fine one, may be recovered. A partial insurance, by a Buffalo company, covers much of the loss. Capt. Hayes, of the WISCONSIN, arrived in town yesterday, and he says the night was clear, and he saw the propeller, while she was yet at some distance, but without the least alarm. As she approached, however, he began to regard her proximity as dangerous, and consequently stopped the boat, he thinks that the collision occurred through the misinterpretation of an order by the helmsman. The WISCONSIN had no freight on board beyond her fuel and supplies. Built in Cleveland, Ohio in 1868 by E.M. Peck, the CITY OF CONCORD was part of the Northern Transportation Company fleet. She was 135.2' x 25.8' x 11.0 draft. In 1881 she was sold out of the Northern Transit Company fleet to J.E. Botsford, J.A. Botsford and Frank Hebner of Port Huron, Michigan. Over the winter of 1881/1882 she was rebuilt, all her cabins were removed. She was sold again in 1895 and rebuilt, this time she had a second mast added. At the time of her sinking she was owned by the Mills Transportation Company of Marysville, Michigan. On May 24th, 1906, she sunk at the coal dock in Cleveland while loading coal. It took over five weeks to finally raise her. The CONCORD, DONALDSON and MONTPELIER loaded coal at Cleveland on Saturday, September 29th, 1906 and cleared the harbor in the evening. The NEGUANEE loaded coal at Lorain and was picked up by the CONCORD in the lake. With the three barges in tow, the CONCORD started up the lake. In a storm and heavy seas, the CITY OF CONCORD sunk about 10 miles off Huron. 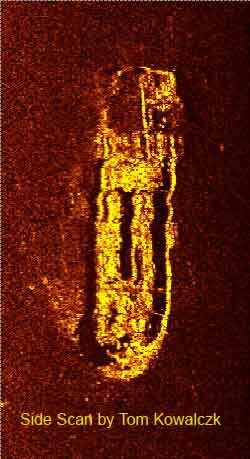 Discovered in 1980 by Jim Paap using a Wesmar SS500 side scan sonar, the Propeller CITY OF CONCORD is in the best condition of all the shipwrecks near the islands. The CITY OF CONCORD most certainly was salvaged. Her deck was removed and lies on the bottom along her starboard side. Most of the coal has been removed from the cargo hold forward of the boiler and engine. The stern behind the engine is still covered with deck planking and the hull sides extend upward from the bottom about 8 feet. The MAST mooring block and buoy were placed on the wreck in June, 2011. Built at Vermilion, Ohio in 1857 by Isaac W. Nickolas for Alva Bradley, Cleveland. She was 138'0" x 26'0" x 11'8". Her official number was #8183. At the time of her loss she was owned by Capt. James Lawler, who purchased her from Capt. A. Bradley of Cleveland just before her sinking. The schooner EXCHANGE went aground near the end of the old railroad dock on the south side of Kelleys Island on November 20, 1874. She had received a load of stone at the Middle dock and drifted into the shallows before she could sail away. 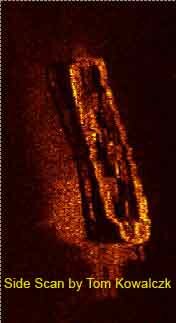 Unable to float her, she spent the winter of 1874 sunk near the dock. Several attempts to raise her the next year failed and most of the stone was removed from her hold. She was finally abandoned. The scow SUTLER GIRL dismantled the schooner EXCHANGE. taking much of the rigging, the topmasts, nearly all the deck chains, etc. in August, 1875. Slowly going to pieces, her main mast fell during a spring storm in 1876 as she continued to break up. 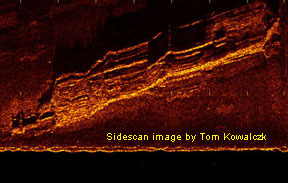 The side scan image was taken May, 2005. The centerboard box is clearly visible as is the stem and the stern post. 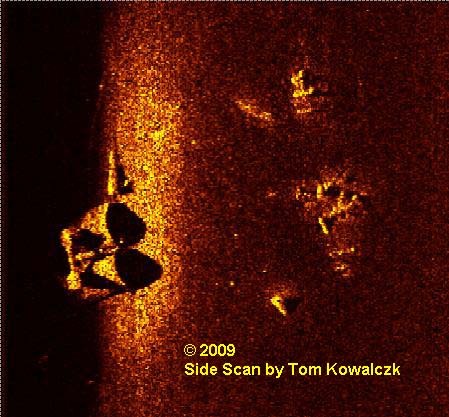 In 14' of water, the hull and remaining stone cargo rise about six feet off the bottom. Built at Allegena, Michigan in 1866 by A.C. McMillian for Ira Chaffee of Saugatuck. She had a high pressure, non condensing single cylinder engine 18" diameter x 24" stroke, 300 hp at 95 revolutions and a fire-box boiler 6'6"dia. x 12'0" length with one furnace which carried 90# steam. The boiler and engine were installed at Saugatuck. The propeller GEORGE DUNBAR was 135.5' x 25.3' x 9.1' draft. Her official number was 6496, first enrolled at Chicago on July 24, 1867. After a major rebuild in 1896 she got a new certificate #10890 and was part of the Cobb estate of Chicago. In 1902 she was owned by the Saginaw Bay Company (C.H. Prescott Jr.) of Cleveland. On June 29, 1902 the DUNBAR left Cleveland at 6:00 PM bound for Alpena, Michigan with a load of coal. Running full speed ahead in heavy seas until she began to take water on badly about 10 - 12 miles from NE shore of Kelleys Island. At that time, she turned into the wind. The captain, regarding her as lost, as she was settling fast, launched a yawl together with his wife, daughter and two mates. The remainder of the crew stayed and presumably went down with the ship. The location by the owner was so far from correct that a search in that vicinity failed to discover the vessel. 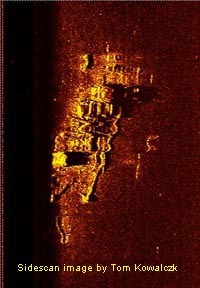 Later found by The STATE OF NEW YORK, the wreck was surveyed by the Army Corp of Engineers vessel VISITOR on July 18th, The wreck was determined to be a menace to navigation. 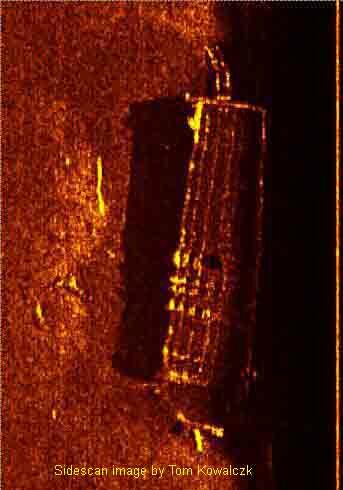 The foremast was still standing with an association flag attached and the wreckage of the pilot house was floating attached to the wreck. The owners abandoned her as a total loss and the government gave a contract for removal to E.J. Dodge of Put-in-Bay. 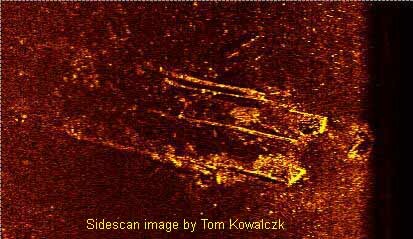 On the 24th of October, 1902, it was reported by the inspector that the wreck had been completely removed to a depth of not less than 30 feet at mean level of Lake Erie. Located in 1976 by K Chaffee in 42 feet of water, the little engine and boiler stand about 10' from the bottom. The deck is gone but there is coal in the hold. 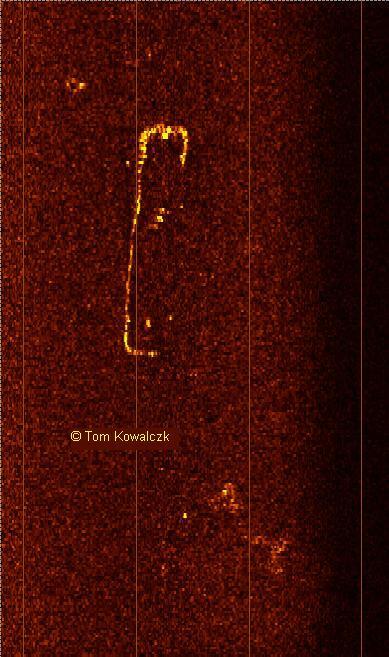 A large windlass in the bow has chains running away from the wreck into the soft mud bottom. The anchors are probably attached. Built at Milwaukee, Wisconsin in 1861, she was 145'x32'x12'. Originally built as a bark, she was converted to a schooner and then a barge. The CONSTITUTION went down at the west dock of the Kelleys Island Lime & Transportation Company on September 20, 1906. She was owned by Runnels & Sinclair of Port Huron. Over loaded with a big cargo of stone including a deck load she began to leak, settled down and nearly capsized. A lighter removed most of her cargo. The schooner was finally blown up, removed and towed behind the dock. Owned and operated by the LeBeau Wrecking Company, the dredge TOLEDO had been at work making fill around the base grounds of the Perry Memorial site at Put-in-Bay on South Bass Island. Completing the work, the dredge was in tow of the tug BURLEY, also owned by the LeBeau Wrecking Co. of Toledo. When about three miles northwest of Rattlesnake Island they encountered strong winds and high seas. After a battle with the wind and waves, Captain LeBeau decided to turn back. During the turn, the dredge lurched and began to sink. All hands did their best to save her but it was too late. She went down in about 30 feet of water. 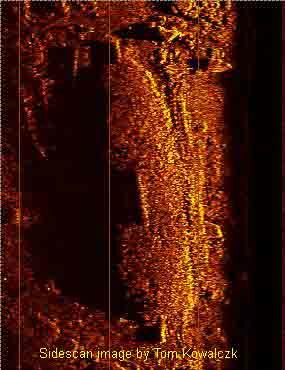 The Prince is a popular dive site, easy to locate (normally buoyed) and in shallow water east of Kelleys Island. On Tuesday, August 8, 1911 the steamer caught fire in the open lake, under the command of Captain H.H. Parsons the Prince was bound for Cleveland with a cargo of gravel. The upper part of her bow was discovered in flames that at times shot as high as thirty feet in the air. The sand suckers Mary H., Clinton, Protection and Albert Y. Gowan were working in the lake off Cedar Point, and their captains and crews realizing the danger the burning craft faced, went to her assistance. They arrived and by pouring four streams of water upon the Prince they succeeded in saving her but not until after her pilot house and superstructure in the rear as far back as the No. 2 hatch, had been destroyed. When the flames were discovered the captain of the Prince ordered the boat backed into a gale that was blowing from the northwest. This had the effect of carrying the flames over the bow and away from the stern and did more than anything else toward saving the boat from total destruction. Captain and crew remained aboard the threatened steamer until the fire was put out. Although the life savers from the Marblehead station were summoned to the Prince, their services were not needed as the sand suckers and the dozen smaller boats from Kelleys Island were ready to rescue the captain and crew on a moments notice. 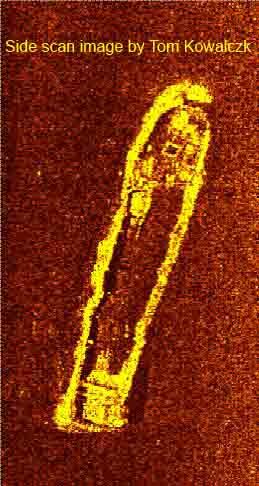 The Prince was a wooden vessel, 240 feet long and 2,047 gross tons, 1,547 net tons. She was built in Detroit in 1890 and was originally a packet freighter but her upper deck works were nearly all removed for the trade she has recently been engaged in. Late Tuesday afternoon word came from Kelleys Island that the Prince had been beached and that the flames were still raging in her hull. It was apparent then that there was great danger of the total destruction of the boat. Tuesday night it was believed that she could be recommissioned after receiving an overhauling. The vessel was insured for $35,000.00. While Captain H. H Parsons was beaching his boat, the fire ate its way almost half way to the stern. Following the survey of the Prince the full extent of the damage was determined to exceed the value of the insurance. In addition, the sand suckers that aided in extinguishing the fire filed a salvage claim insisting the aid rendered prevented the boat from burning to the water's edge. Despite the fact that the boat was held by the federal authorities, persons unknown were said to have rushed aboard and stripped the boat of about everything of any value, then the boat "mysteriously" burst into flames again completely destroying her. It is said some of the furniture and other items can still be seen today in the older homes on the island. Ultimately, the vessels works were salvaged. The two scotch 12' diameter boilers and the 800 HP. Fore & Aft compound engine were removed. The shaft and four blade propeller were salvaged by the Shrock Salvage company in the 1980's and can be seen displayed in the front of their marina complex on North Shore Blvd., Lakeside, Ohio. One of the propeller blades had been sheared off by the ice and was located by divers, recovered and re-attached to the propeller a few years ago. The steam barge SPADEMAN, of Marine City, coal laden and bound for Sarnia in tow of the steamer HURON CITY, sprung a leak and sunk in Lake Erie south of the Put-in-Bay light, between Put-in-Bay and Green Island. The SPADEMAN sprung a leak and sank in twenty minutes. Her captain, after he began to realize that something was wrong, instituted and investigation and found four feet of water in the vessel's hold, he signaled the HURON CITY and the work of rescue, instituted at once, was accomplished none too soon. The last man was hardly off before the SPADEMAN disappeared almost entirely from view. When the steamer HURON CITY arrived in Huron her bow was covered with ice, but she had won a victory over the gale and bore in addition to every man of her own crew, the four persons on the sunken barge. The lake froze over that night. The ice was 3" thick the next day. 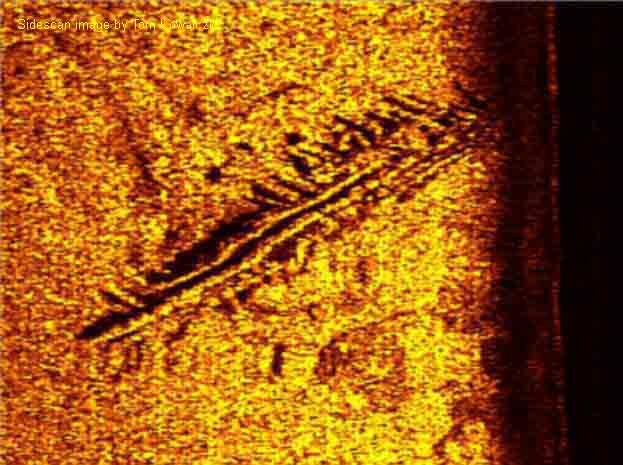 The wreck was located April 11, 1910 by the U.S. Army Corp of Engineers. 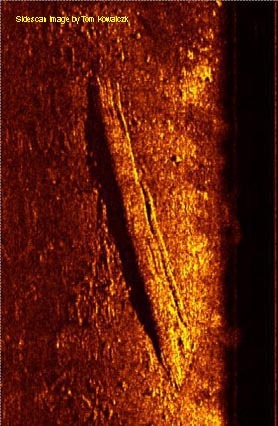 At the time, depths of water over the wreck varied from 17 to 25 feet. 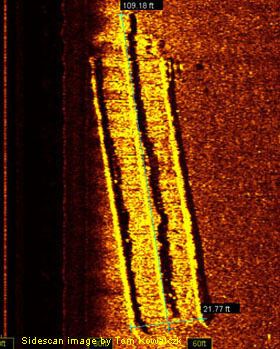 Action was taken to remove the wreck with dynamite, to a clear depth of 28 feet. The work was completed during the month of April. All the cargo of 500 tons of coal was salvaged by E.J. Dodge of Put-in-Bay in 1911. 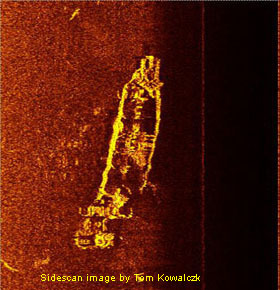 Very little remains today, as can be seen in the side scan image. 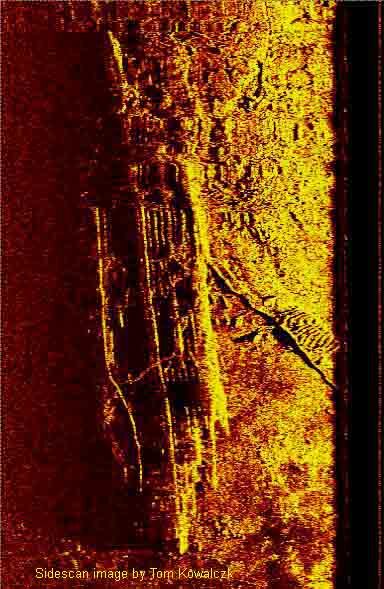 It is difficult to even make out the shape of the hull. 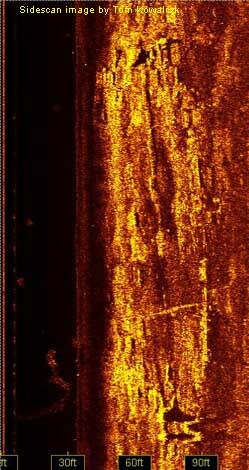 Located in a very busy and heavily traveled area, pleasure boats and poor visibility make this area very difficult to dive. On May 1, 1917, the steamer CASE was bound for Detroit from Cleveland, carrying two thousand tons of coal. While near East Sister she sprung a leak and began to settle. She was brought close to the island and the captain and crew escaped there. While abandoning the CASE a lantern was knocked over in the engine room setting the fire. The vessel burned for three days destroying her to the water line. In August, 1917 a Canadian Wrecking Co. salvaged the engine and boiler and everything else of value. Built in Perrysburg, Ohio by Samuel Hubbell in 1837 as the General Wayne. She was 156 x 27 x 10. She run on the Toledo, Sandusky, Cleveland to Buffalo route for the Perrysburg & Miami Steamboat Company. In 1847 she was sold to Charles Howard of Detroit, Michigan. She was completely rebuilt in the winter of 1849 with new boilers and the high pressure horizontal steam engine from the Steamboat COLUMBUS which wrecked on the pier at Dunkirk in 1848. The WAYNE left Toledo at 9 o'clock on Saturday morning, April 28th, 1850 with about twenty five passengers and took on some forty more at Sandusky on Saturday night, leaving there at 10 o'clock. These, and the crew made the number on board from ninety to one hundred. About half-past 12 this A. M., (Sunday,) just below Vermillion, and some eight miles from shore, the two starboard boilers exploded throwing them into a perpendicular position, tearing away the steerage cabin above and shattering the hull badly. She sank in fifteen minutes, going down head foremost. The steamer CLARION was bound from Chicago to Buffalo with a load of corn when she was sighted by a passing ship that reported her burning. 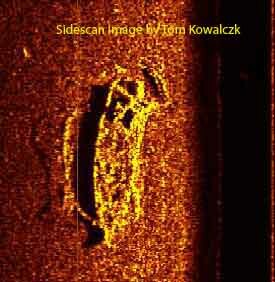 The CLARION burned to the water line east of SE Shoal, Pelee Point, Lake Erie. Built in 1881 at Wyandotte, Michigan by the Detroit DryDock Co. She was 240' x 36' x 15' in dimension. She had an iron hull with wooden upper works.